Sonoko - Les Anges, Les Bonheurs. Vinyl EP. Bleep. More audio treasures from one of our favourite recent labels, Nosedrip’s very own Stroom. STRLP009 looks back at the musical history of Nosedrip’s home country (Belgium) to present four previously unheard compositions from Crammed Discs affiliate Sonoko. 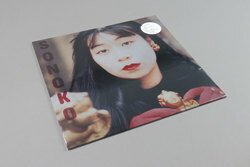 The Japanese/French singer weaves her way through four ethereal, late night lullabies that bring to mind Penultimate Press’s Ksiezyc or previous Stroom artists NSRD. You know the drill. No fancy club hits here, but four avant-pop songs that will hopefully keep close to you over the remaining winter months. Shout out to Ziggy for the hundredth time!